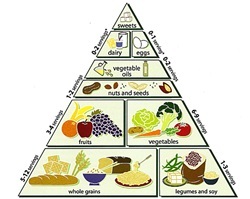 The vegetarian food pyramid is a visual representation of the various vegetarian food groups that are recommended to maintain a healthy, balanced diet. While many believe that you can't, you can obtain everything your body needs on a meat free diet. In fact, you can do it just as easily, and a whole lot healthier than you can on a carnivorous one. All you need to know to achieve the right balance for you is... what type of foods to eat, how to combine the foods you eat, and how much of each food to eat. The vegetarian food pyramid is a great tool to help guide you in planning well-balanced vegetarian meals that are both delicious and nutritionally sound, and it's one of the easiest ways to make sure you are satisfying all of your nutritional needs. To understand the vegetarian food pyramid you must first understand what the typical vegetarian diet includes, and just as important... what it excludes. This of course, depends on the type of vegetarian. A Lacto-Ovo Vegetarian diet excludes meat, fish, and poultry, as well as any food that contains any of the aforementioned ingredients. However, it allows for the consumption of dairy products and eggs. A Lacto-Vegetarian diet excludes meat, fish, poultry and eggs, as well as any food that contains them. However, it allows for the consumption of dairy products such as milk, cheese, cottage cheese, yogurt and butter. An Ovo-Vegetarian diet is, in essence, the opposite of a Lacto-Vegetarian diet. It allows for the consumption of eggs, but excludes dairy products and meat of any kind. A Vegan diet, often referred to as a "complete vegetarian diet", excludes meat, dairy, eggs and any food that contains these or other animal ingredients or by-products. 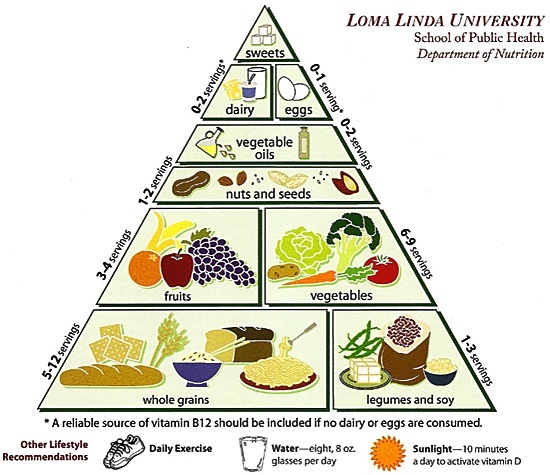 How Does the Food Pyramid Help Vegetarians Find Balance in Their Everyday Meals? Each food group represented on the vegetarian food pyramid represents a type of nutrient or macro-nutrient that your body needs to function at its peak. Eat a variety of foods from each group in your daily meals and snacks, with a focus on whole, unrefined food and you're already eating a healthier, more balanced diet than most American adults do. The vegetarian pyramid is a guide to help you familiarize yourself with the type of food you need to be eating, and how much of it your body needs. If you use this tool as it is intended to be used, you will find that getting your required nutrients on a meatless diet is actually quite easy. Since the base of the pyramid is the support for all of the following levels, we'll start there and work our way up. Whole grains make up the largest of all the food groups, and form the base that supports a well balanced diet. While almost everyone you talk to will tell you carbs are bad, the truth is... all carbs are not created equal. Whole, unrefined grains are a necessary part of a healthy diet. Your body absolutely needs them. The key is to differentiate between unrefined and refined carbs. Tip: At least half of your total consumed carbs should be whole, unrefined grains. Legumes and soy are great sources of vegetarian protein, but they are also rich in antioxidants and they provide a variety of essential nutrients that your body uses in important processes. Vitamins, minerals and nutrients such as zinc, calcium, iron, folate, fiber, potassium, phosphorus, selenium and vitamins B1, B2, B3, B5 and B6 can all be found in legumes. What Foods are in this Food Group? Black beans, navy beans, cannelini beans, kidney beans, chickpeas, pinto beans, edamame, peas, peanuts, green beans, alfalfa and lentils are all types of legumes. Tofu, tempeh, soy milk and other soy products, meat analogue are all sources of soy protein. Fruit and vegetables make up the next level of the pyramid. It is recommended that you eat both with every meal, and in as much a variety as possible. The more variety you include in your diet, the more beneficial they are for your body. Fruits and vegetables are a great sources of vitamins, minerals, antioxidants, fiber and phytochemicals, not to mention they are cholesterol free and naturally low in fat. Eating more fruits and vegetables in your diet can reduce your risk of stroke, type 2 diabetes, and certain cancers among other things. Nuts and seeds are yet another great source of protein, but we also need them for the healthy fats that they provide. Yes you heard me right. Fats are another nutrient that gets a bad reputation because people lump them all together. As I mentioned when we were talking about carbs, all fats are NOT created equal. Healthy fats are good for you and nuts and seeds are a great source. Eat them daily and eat them in as much variety as you can. Having the recommended 1-2 servings daily from this food group can reduce high cholesterol and help you maintain a healthy heart and a healthy mind... not to mention they keep you feeling full throughout the day. Pine nuts, almonds, walnuts, cashews, hazelnuts, pistachios, pecans, peanut butter, almond butter, brazil nuts, peanuts (though they are technically not a nut), pumpkin seeds, sesame seeds and sunflower seeds. Vegetable oils are another way for your body to obtain the healthy fats that are essential in helping your body fight off disease and prevent chronic health issues. They contain omega-3 fatty acids which are essential nutrients that cannot be produced within the body. Omega 3's play an important role in maintaining a healthy heart, mind and body. If included regularly in your diet vegetable oil may decrease your risk for developing cardiovascular diseases as well as breast cancer. Vegetable oil, olive oil, coconut oil, almond oil, canola oil, flaxseed oil, corn oil, palm oil, peanut oil, rapeseed oil, safflower oil, sesame oil, soybean oil, sunflower oil, mustard oil, almond oil, beech nut oil, cashew oil, hazelnut oil, pine nut oil and walnut oil. Eggs are a great source of vitamins, nutrients and essential amino acids. They are a wonderful source of protein and healthy fats, and they contain a multitude of other nutrients your body needs for important processes. These vitamins and nutrients include b2, a, d, b12, b6, folate, biotin, calcium, iron, magnesium, potassium, thiamin, vitamin e and vitamin k.
Eating eggs regularly can help aid your body in maintaining healthy brain function, muscle growth and prevention of muscle loss, weight management, healthy eyes and a healthy heart. Dairy products are also quite beneficial for Lacto and Lacto Ovo vegetarians. Milk, cheese and yogurt are great sources of protein and calcium among other things. Yogurt in particular is a wonderful source of probiotics (healthy bacteria) that aid in helping your body maintain a healthy digestive tract. The vitamins and nutrients contained in dairy products aid in building healthy bones, managing weight, maintaining a strong immune system and can reduce the risk of developing diabetes, cancer and certain risk factors for heart disease. As I'm sure you already know... sweets are not a necessary part of a healthy diet. This group includes all those tasty treats that we love so much, but should only be eaten in moderation, therefore there are no daily serving recommendations other than to eat them only on occasion and as sparingly as possible. Sweets are packed with carbs, fats, artificial ingredients and preservatives that offer no nutritional value to your body whatsoever. In fact, sugar has been proven to be as addictive as, sometimes even more so, than cocaine and other illegal substances. Studies have shown that people who consume a vegetarian diet have the lowest rate of cancer and chronic illness and a higher life expectancy than those who consume a diet packed with animal proteins and processed foods. Many of the foods contained in the vegetarian diet pyramid are unprocessed and unrefined, so your body can extract vital nutrients from them and digest them much easier than the Standard American Diet. In addition, consumption of cleaner, more natural food provides your body essential nutrients that help it to perform at peak condition. It's not uncommon for people to feel lighter, more energized and overall more healthful on a plant based diet.